Morpho Gallery pleased to announce its 10th annual juried photo exhibit. Photographers are invited to submit work for possible inclusion in the exhibition. Size limitation is 36” maximum in any direction, framing included. Original photography only, any and all subject matters or photo processes welcomed. $25 for three (3) images, $5 for each additional image, limited to five per person. The fee is non-refundable. Judging will be done from on-line .jpg images, submitted with the completed entry form and entry fee paid through Paypal (see details below). The official entry form can be downloaded at http://www.morphogallery.com/links.htm (on the links page). Entries will also be accepted by mail on CD, accompanied with the entry form and check, mailed to Morpho Gallery, 5216 N. Damen, Chicago, IL 60625. First place award(s) is a month long solo exhibition at Morpho Gallery, including an opening night event, postcards and advertising. Award(s) will be announced at the opening night reception. Christopher Schneberger is a Chicago photographer and has been a recipient of an Illinois Arts Council individual artist grant twice. His work has been exhibited nationally and internationally. Recent exhibitions include: The Los Angeles Center for Digital Art and the Annenberg Space for Photography in Los Angeles; Dorsky Projects in New York; GeocartoInternational in Hong Kong and Printworks Gallery in Chicago where he is represented. Chris is an Adjunct Professor at Columbia College Chicago and the College of DuPage. He is a founding member and on the board of directors of Perspective Gallery in Evanston, Illinois, a not-for-profit, community-oriented cooperative whose purpose is to promote photography as fine art. He has curated several exhibitions of photography including “Realms” and “This Particular Patch” at Perspective Gallery. Chris received his BFA from the University of Florida and his MFA from Indiana University. He is also the drummer for the band Moon. Connection Lost is a fine art photography exhibition by Lauren Giuliani. Through use of alternative photographic methods, this collection of silver gelatin prints discusses human interaction and connection to nature. This exhibition is located on the second floor of a tavola at 2148 W Chicago Ave, Chicago, IL, 60622. Opening reception isWednesday, February 25. Stop by between 5:30 and 8:30pm for some wine, snacks and fine art! Morpho Gallery is pleased to welcome winners of the 9th Annual Juried Photography Exhibition, Brett Stoddart & Martha Kubica. Selected by John Morrison, winners will present their photographs from October 31- November 26, 2014. Join us for an opening reception/Halloween party on Friday, October 31st from 6 – 9 pm for a chance to meet the artists. Costumes are encouraged! Morpho Gallery is pleased to announce Urban Dreams. This exhibition features the work of Marie Laigneau, Mirela Momanu, and Yves Vernin. Urban Dreams explores the mysterious and invisible relationship connecting people to their urban surroundings. Through the use of unusual perspectives, shadow play and reflections, the cities we’ve known forever take the substance of dreams – ethereal and mysterious, foreign and strange. As a group of artists, we are seeking to question the way we usually experience urban life. By transforming the ordinary into the extraordinary, by casting a new light on the most usual scenes, our intention is to unveil the unconscious emotions that connect us to our cities, and to ourselves. Marie Laigneau, USA – Marie’s images portray a timeless and overshadowing city, made of silence and whispers. In her work, the constant opposition between light and darkness seems to overpower her subjects, creating tension and unbalance. Her lonely figures evolve in a foreign, yet familiar world, reminiscent of forgotten dreams and memories. Yves Vernin, France – Yves’ images are stories of shadows and light. Yves expands on this theme by showing how the mundane can easily become extraordinary if one understands the true beauty of light. His images portray a city transformed by the joyful sun, where shadows create rhythmic worlds shattering our common perception of urbanity. 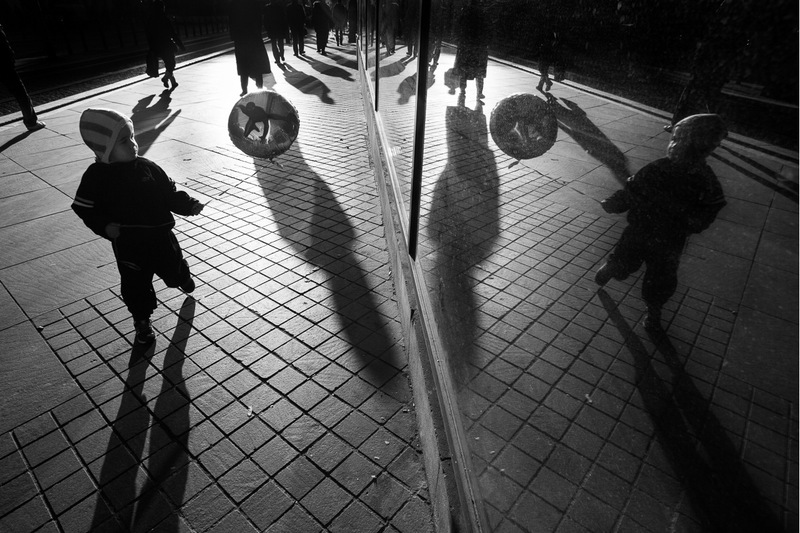 Mirela Momanu, Romania – Mirela’s images take us to a world of silence and introspection. Her lonely figures are fleeting silhouettes evolving into the darkness of highly geometrical settings. Mirela portrays one of the most mysterious aspects of cities, made of steel and concrete, of evasive light and repetitive patterns. Her subjects are faced with themselves, in the silence of their surroundings. Morpho Gallery prides itself in seeking talented artists who are on the cusp of being discovered by the mainstream art community. We invite local artists to exhibit their work in a creative and non-competitive atmosphere where artistic experimentation and development are encouraged. By creating a blank palette inside the gallery, we offer infinite possibilities for an array of colors, textures and media to come together. Morpho Gallery also offers leasing packages at affordable rates to groups and individuals who wish to stage their own shows.